ADU will soon be AHU. Learn more. Adventist University of Health Sciences is a Seventh-day Adventist institution specializing in healthcare education in a faith-affirming environment. Service-oriented and guided by the values of nurture, excellence, spirituality, and stewardship, the University seeks to develop leaders who will practice healthcare as a ministry. Adventist University of Health Sciences embraces the benefit of whole person care as demonstrated in the life and ministry of Christ. The University is dedicated to developing skilled professionals who live the healing values of Christ. Graduates who live these values effectively extend the healing ministry of Christ. ADU will be an institution that encourages the personal and professional growth of its students, faculty, and staff by nourishing spiritual development, fostering self-understanding, and encouraging a zeal for knowledge and service. ADU will be an institution whose programs are built upon an optimal blend of superior pedagogy, technology, and spiritual values—a blend designed to lead graduates to the highest level of professional practice. ADU will be an institution where Christian professionalism is such an integral part of its programs and practices that it becomes the distinguishing characteristic of the organization. ADU will be an institution where the wise stewardship of its human, intellectual, financial, and physical resources enables the University to achieve outcomes consistent with its mission. ADU provides meaningful opportunity to support student success through a strong trust with outstanding faculty. 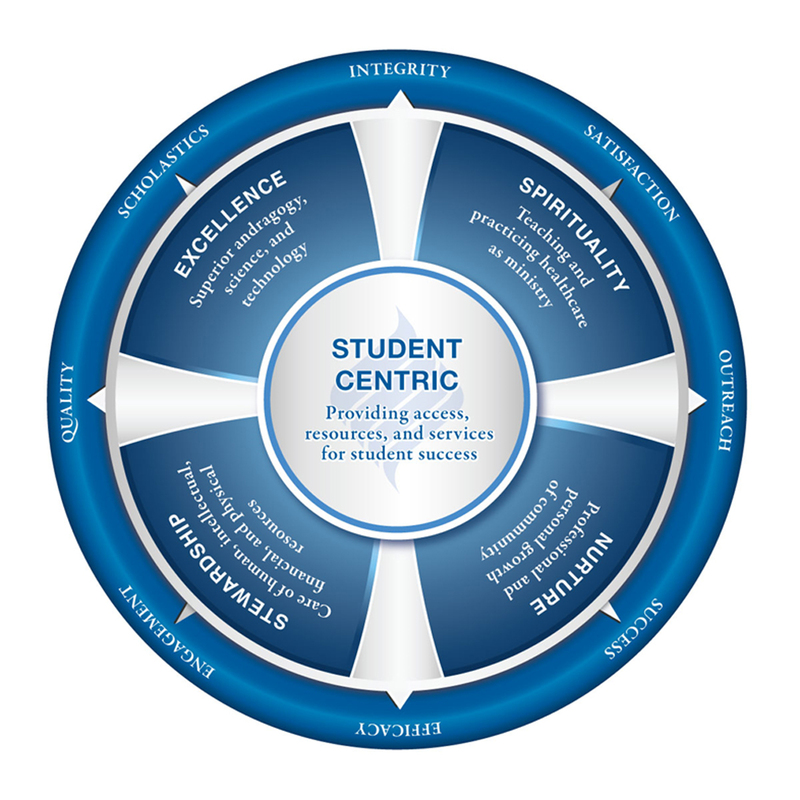 This two-way relationship aligns and engages the student in mission and academic excellence. As a faith-based institution, ADU is privileged to promote a culture of high expectations in all ADU’s premier academic programs because ADU faculty and staff are accountable to One greater than themselves. This same philosophy is evident in all Adventist healthcare facilities. Student experience is further enhanced by small class sizes, individual mentoring, and research opportunities. ADU extends this invitation to partner toward success to every student. ADU is built on a rich tradition where world class professionals are developed with the skill the heal and the spirit to care. We are more than academics. We are a university with a unique mission – A mission to develop skilled professionals who live the healing values of christ. Learn more about our 25 years dedicated to educating our students, serving our community, and living our mission. Adventist University of Health Sciences has a rich tradition associated with the pioneering healthcare (1866) and education (1872) reform movements started by the Seventh-day Adventist Church. The church now operates one of the largest worldwide networks of healthcare and education facilities in the world. The healthcare system extends the healing ministry of Christ to patients at 173 hospitals, 126 nursing homes, and 294 clinics around the world. The University campus is located next to Florida Hospital – one of the largest medical facilities on earth – and for several years running the #1 rated hospital in Florida (U.S. News & World Report). These days, in more ways than one, we’re part of something bigger. Adventist Health System is 45 hospital campuses, Nearly 8,300 licensed beds, 10 states, More than 4.5 million patients annually. Being founded by Florida Hospital and the Adventist Health System network makes us one of the most well-connected healthcare universities in the nation. At ADU, we believe in Service. As part of the curriculum, our students engage in service activities with intentional academic goals and opportunities for reflection that connects to their academic discipline. Over the past few years, our community has expanded beyond Orlando. For those looking to learn remotely, we offer affordable, convenient online degree programs that are geared toward the working professional. The following program pages provide further detail on each online program available. Want to know if online education is right for you?